"Any food with a purposefully misspelled name has to be good," I said to my coworker in the breakroom the other day when presented with an infamous east coast goody by the name of Tastykake. I had the Peanut Butter Kandy Kake variety, and I'll have to say, all of those excessive K's were definitely brought out in the taste of this sugar-laden treat. As I type this review, I still have the aftertaste of chemical-laden peanut butter in the back of my throat and my leg won't stop shaking from the sugar rush. Good stuff! When I first took a look at the package, I was imaging something similar to a Tagalong (of Girl Scout cookie fame). However, the taste turned out to be completely different than what I expected. The cake is a nearly tasteless, fluffy, dry angel food cake, not a white or yellow cake like a Hostess treat. The chocolate is good, strong and sweet, and the thin layer of peanut butter adds a delicious extra dimension to the flavor. Now I'm definitely curious to try some other varieties of Tastykake brand sweets, so I'll definitely be getting some on my next trip east. I'm not usually into sweets as much as I am salty snacks, but if I saw these in the store and needed a quick junk-food sugar rush, I'd grab one of these. Krimpets are also the shiznick! 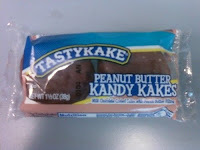 They used to be even more comically misspelled: when I was a kid, they were Tastykake Tandy Takes. Eventually they decided the name wasn't as transparent as they'd thought. In descending order of yumminess, my favorite Tastykake products are Peanut Butter Kandy Kakes, Butterscotch Krimpets and (a distant third) their Apple Pies. Kandy Kakes are made with sponge cake, not angelfood cake. If you liked these, you definitely have to try the Butterscotch Krimpets. They are my second fave! I am from Baltimore & whenever I go back to visit my family, these are a must have. These and Utz Crab Chips. Just an added note, Steven Capsuto and I share the exact same favorites, but for me I also enjoy lemon and pumpkin pie and jelly krimpets.